Here, Terry talks money to a group of young traders, convincing them that despite their hopes of striking it rich in the markets, they need a slow and steady plan. Hear Terry explain how she creates a relevant speech on the economic outlook, the political implications, and the financial markets — all crafted to reach your specific audience. Major corporate clients including Hilton, Motorola, CUNA Mutual, John Hancock, Fidelity, and many others use Terry's services as a skilled moderator — keeping the attention of the audience and effortlessly maintaining your schedule through several days of programming. Whether moderating a panel or interviewing the CEO, Terry does her homework and works with your meeting planners to achieve your desired results. Her quick wit and intelligence, plus her years of experience hosting her own TV interview show, ensure that your meeting will be lively, entertaining — and to the point. 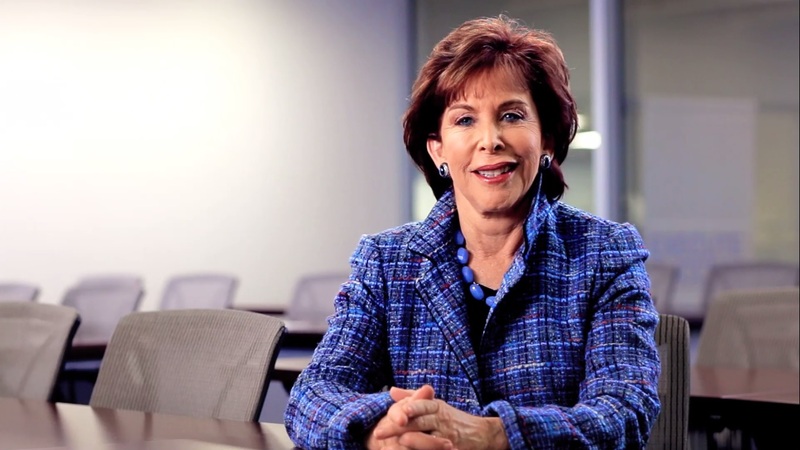 Corporations use Terry's respected advice and independent point of view to educate their employees about benefits programs, company retirement plans, and overall financial planning. Ask Walmart, Allstate, Walgreens, CNA Insurance, McDonalds, and others who have brought Terry back year-after-year to refresh and update their employee's knowledge of personal investment and retirement planning — from the basics of wise use of credit to the importance of investing for growth in the company plan. To request information and availability for Terry, please work with a Speakers Bureau of your choice, or contact Terry at 312-266-1717 or Terry@TerrySavage.com. Terry Savage, Financial Advisor to Walmart Employees! 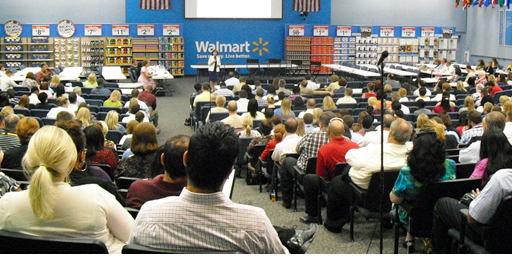 The Savage Truth on Money, at Walmart’s corporate headquarters in Bentonville, AR, kicks off a four-month program in financial literacy for Walmart employees. Every week a new short video giving Terry’s Tips will be posted on the employee website, and Walmart associates will have direct access to Terry’s blog at www.TerrySavage.com to post their personal finance questions. Savage will also write for the Wal-Mart employee magazine. Terry, I wanted to let you know how much our audience enjoyed your speaking engagement yesterday at the Metropolitan Club. The topic resonated with our clients and prospects in attendance, and you did an excellent job tying your subject matter to the insurance crowd. I heard so many favorable comments, and your ability to relate the various financial and economic themes to our guests was a big factor in the positive reception. Thanks again for helping to make our event a success! I can’t thank you enough for today. Your talk was so interesting, and you gave everyone in the room some real information they could use today and a sense of optimism about the future. I think it was meaningful to people of all ages, at various stages of their careers. Terry, on behalf of the Chicago Chapter of SIM (Society for Information Management), I wanted to thank you for joining us on Monday evening for our Spring Gala event. With over 200 guests, we exceeded our expectations which clearly was a result of your renown recognition in the Chicagoland community. We have received rave reviews and comments from our survey that our guests responded to this week. Thank you again and we appreciate your thought provoking information/presentation Monday evening. I just wanted to tell you that you did an amazing job with your presentation at the HSBC luncheon at the Metropolitan Club! I was captivated by what you said and how well you presented it and delivered so much information and research so efficiently and effectively. The way in which you present the information is so impactful. You are really right on target. I wanted to say that in my opinion you did a terrific job at the OPI Conference in Chicago this week. You are incredibly perceptive and energetic and really draw out of the presenters relevant information that adds value in a way that helps audiences understand what is going on. In short, I thoroughly enjoyed watching you engage the speakers (including myself I might add). I want to personally thank you for your remarkable contribution at MeetDifferent in Atlanta this past week. Your participation in our first ever event motivated and engaged our industry like never before! This is a note of appreciation for your fine efforts and great presentation at the DST Retirement Leadership Forum this week. As always, your thoughts were on target, and highly thought-provoking. I, for one, will be looking at your website as I pursue my own retirement plans! The book is a great tool, and our conference participants really enjoyed receiving it. Robert Reiter, DST Systems, Inc.
We want to thank you for your excellent contribution to our Leaders’ Forum last week. Terry, your presentation did a fantastic job of drawing some important lessons from the current economic climate. It brought the U.S. perspective to the discussion — and that was extremely valuable. I just want to say a really big thank you for your contribution to our meeting. You brought a real energy and pace to the meeting and really maintained the interest of the delegates. You did a great job with encouraging questions…Thank you for all the hard work you put into make this meeting a success and I hope we can work together again in the future.